When we'd last left our heroes they'd just finished trying the Auchentoshan 12 and 18yr olds, part of a 3 part sampler pack purchased because our hero had needed sample bottles in order to send whisky to a friend of his in Queensland, Systemdown, and he'd heard great things about Auchentoshan from Markjedi. So far our hero has not been disappointed in any way, enjoying the 12 yr old and LOVING the 18 yr old. 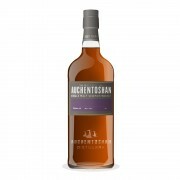 Our heroes wife preferred the 12 yr old to the 18 yr.
Now the last sample in the pack was the Auchentoshan Three Wood. Our hero had heard some very good things about this whisky and was looking forward to it....Alot! When he first cracked open the bottle and poured it's contents into the glencairn the first thing he notices is how dark the whisky is. It is DARK! Possibly caramel coloring? Or possibly the maturation in the three different types of wood casks? Not sure, but a mystery to be solved by Google! another time. The nose is intriguing. First whiff is what I've come to associate as the Auchentoshan whiff, a hint of freshly cut grass, but then with the next whiff bourbon manifests itself while slowly after this the sherry casks make their presence known. Our hero spends roughly an hour or so nosing his glencairn with just the occasional sip, trying to tear apart this whisky. Finally our heroes wife asks him if he's having any problems. He informs her with great dignity that he is not, but that he is curious to see how the nose will develop if the whisky is left to open up. At this point in time the aromas coming out of the whisky is just a hint of cut grass, oak, tiny bit of vanilla, some leather and a tiny bit of smoke in the background. Very intriguing nose. Flavors at this time are sherry, caramel, cherries, some molasses and a tiny hidden bit of chocolate. Finish is LONG! With a bite of alcohol and the spices and a hint of smoke following it down. The hero covers the dram with a plate with the tiniest gap to let the whisky breath over night and comes back to it roughly 24 hours later. When our hero comes back to the whisky he again gets bourbon and sherry on the nose with leather and vanilla, but now there is some slight citrus notes. Flavors this evening are the same as before, but with the added development of butterscotch and a hint of sultanas. Finish is again LONG, but now there is the faintest hint of apples on the tail end. Very yummy. This was a bottle that our hero has decided that he needs to own due to the fact that he'd love to see how oxidation would affect this whisky and what would open up with time! And the good news is that this bottle is readily available for roughly $70 AUS and can be found quite easily. I, the hero, would like to thank both Markjedi and Systemdown for turning me onto this awesome distillery!!! I'm eager to explore it even more! I'm also quite fond of this whisky, but the dark colour is indeed the result of (heavy) caramel colouring, alas. That's what I was figuring, but I wasn't sure. A very interesting whisky and one on my to pick up list. Extremely interesting (for me) nose. @Toomuchclass Why did you post your tasting notes on my review? I'm just curious.